Finished Size 18" x 40"
This is a really fun table runner! It can be made in an afternoon. Think about all the holidays, hostess gifts, or birthdays you can make this for. You can adjust the size to your liking. Assorted Ribbon - at least 14" long. Do not use ribbon with wire in it. You may use all sorts of type, sizes, and colors. 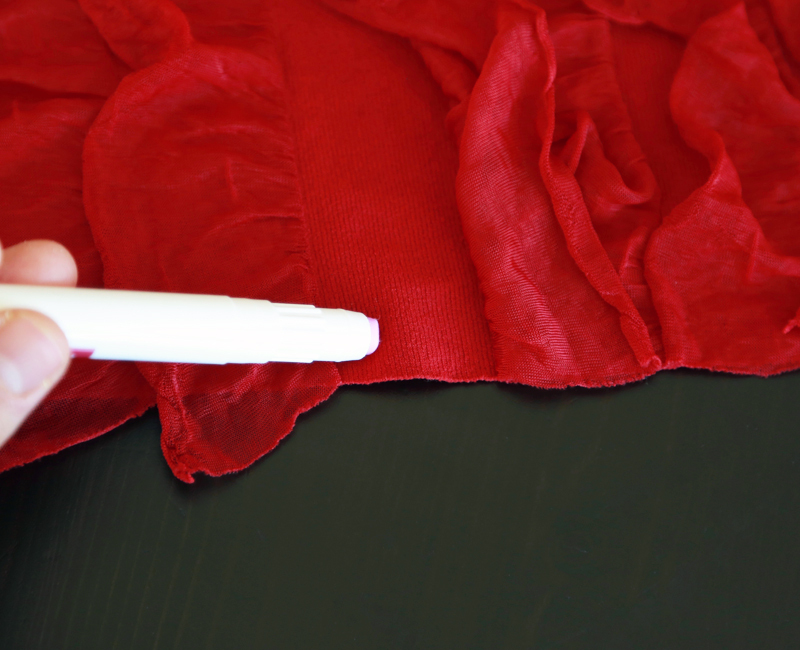 Center Fabric Piece - Cut one 12 ½" x 34 ½"
Using your Sharpie Pen, mark the batting down the center lengthwise and widthwise. Find the vertical and horizontal centers of the Center fabric piece too.....but not with your Sharpie this time. Put pins where the centers are. Pin the center fabric piece to the batting matching the centers lines. To layer, place the muslin on the table first. Lay the batting with the pinned center on top of the muslin. Pin around the edges to secure all the layers. Time to add the ribbons! This is the fun part. You will be sewing the outer borders to the center fabric which will hide all the ribbon ends. You will sew through all the layers (muslin, batting and center fabric) which, in fact, quilts your runner as you go. To start, pin the ribbons in different angles. Be sure each end of the ribbon sticks out beyond the center fabric. Don’t get too close to the ends. Have fun with this. Once you get the design you like, you can begin sewing each strip of ribbon down. Make sure the ribbons are laying smooth and straight. You can use fun decorative stitches and thread to do this. If the ribbons overlap each other, just move the top ribbon so you can sew the lower ribbon down. Using one 3 ½” x 34 ½” strip, pin the strip right sides together along one long side of the runner making sure the strips line up with the sides and top and bottom of the runner center. 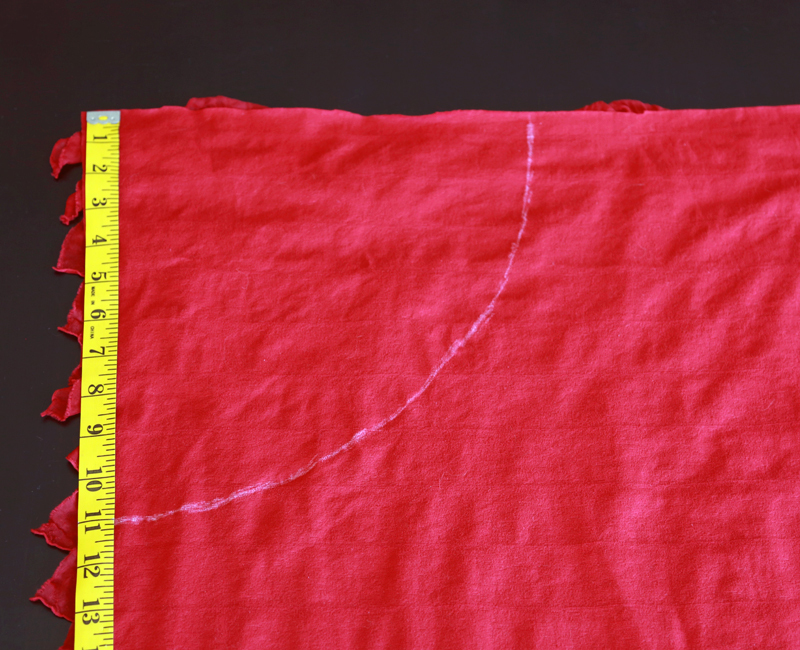 Sew a ¼” seam using So Fine #50 thread. Repeat with the second 3 ½” x 34 ½” strip on the opposite side. Press the strips to the outer part of the runner. Using one 3 ½” x 18 ½” strip, pin the strip right sides together along one short end of the runner making sure the strips line up along the edge and sides of the runner. Stitch as you did for the longer sides. Repeat on the opposite end with the second 3 ½” x 18 ½” strip. Press these strips to the outer part of the runner. Trim off the outer batting and muslin. Your runner should now be 18 ½” x 40 ½”. To sew the back and the front together, pin the main runner piece and the backing fabric together right sides together. 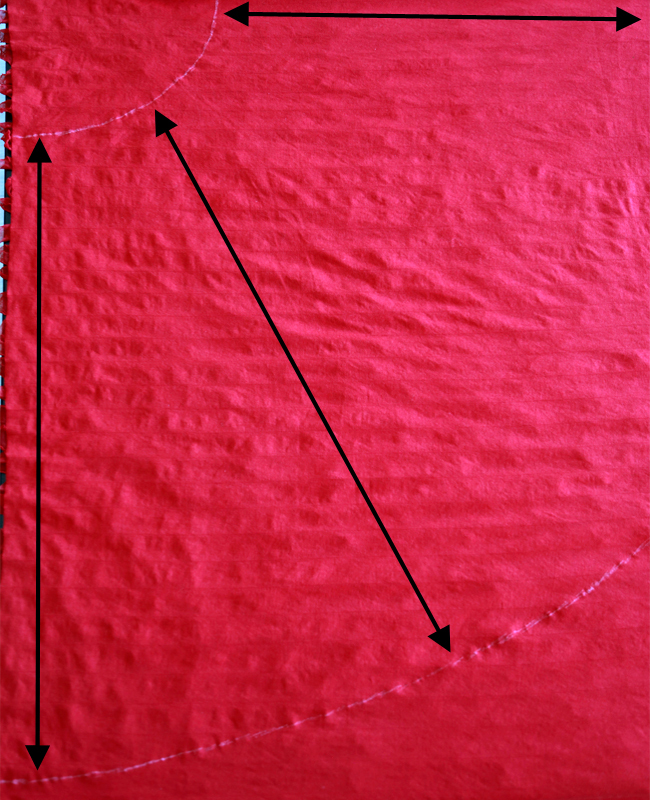 Stitch a ¼” seam around the outer edges leaving a 6”opening. Turn your runner right side out and press. Using a runner stitch, hand sew the opening closed. Using a decorative stitched, stitch around the outer edge of the runner approximately ½” in from the edge. A dictionary definition of a tote bag is described simply as “a large bag for carrying things” or “large two-handled open-topped bag” but we like to think of tote bags as endless options of creativity! Tote bags can be personalized for any person, reason or season. They are truly like a blank canvas of a painting with the added bonus of being very practical. Please download our PDF pattern to view step-by-step instructions on how to make this cute bag. Gearing up for cooler weather and fall colors has me thinking of cute outfits and fun sewing projects. Our store recently received a shipment of Ruffle fabrics and it has inspired me to make a boutique-style skirt from this unique fabric. 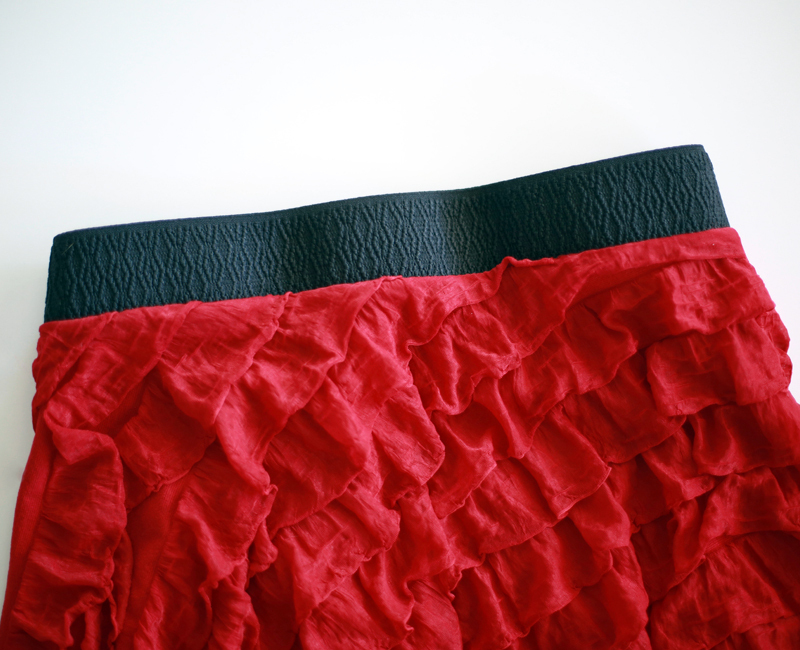 Ruffle fabric is available in many colors and styles, but I happen to be more partial to the color red and really liked the pattern. The fabric itself is durable and slightly heavier than most skirt fabric. This helps with draping, as the weight keeps the skirt hanging down in an even manner. Making this skirt was a lot of fun because I learned how to sew on angles and the finished product is something that I can use and enjoy. Now that I've learned how to make a skirt, I'm already planning matching skirts for my nieces! 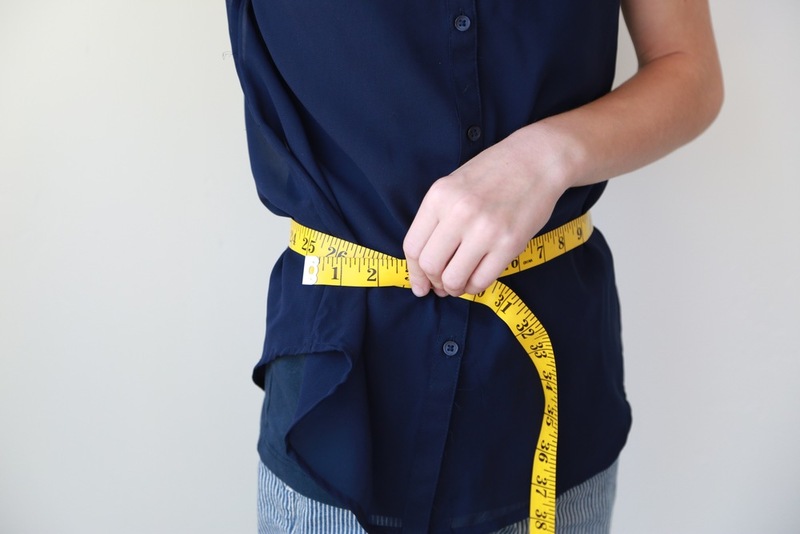 Measure the elastic by stretching it snugly around your waist (or anywhere near the hip/waist area you want the elastic to sit at). Record this measurement. Add 1 inch to this measurement to allow for seam allowances. 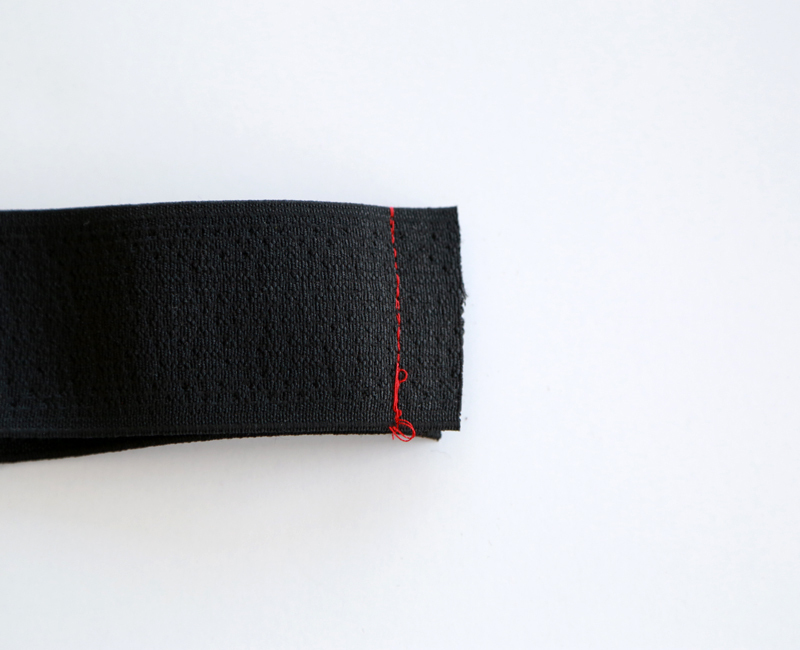 Cut the elastic at the marked length. 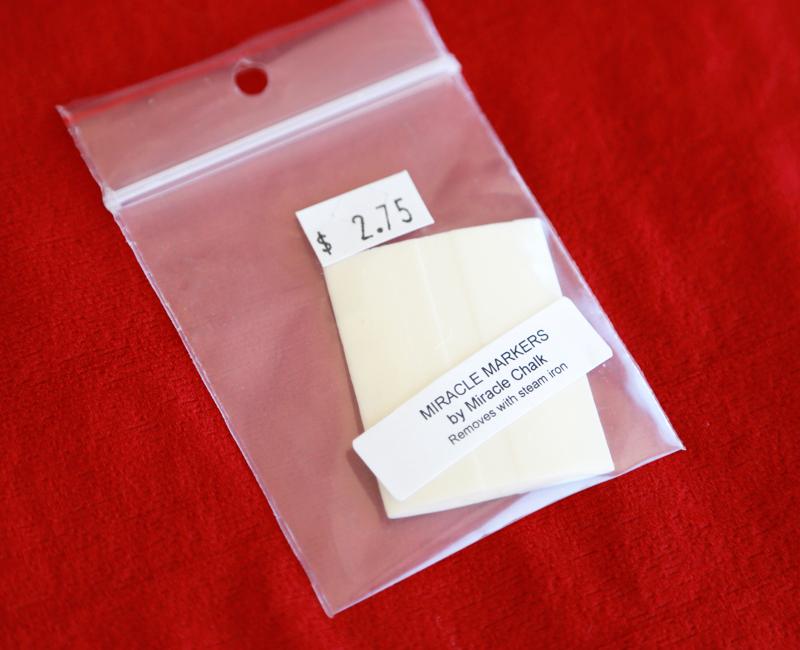 We used this method elastics have different amounts of stretch depending on the type and brand and we've found that not everyone wants the same amount of snugness for their skirts. Something to note: The elastic band holds all the weight for the ruffle fabric, so if you are going to err on too snug or too loose, too snug is better. For example: If my stretched measurement is 34 inches, my cut measurement will be at 35 inches. To determine how much ruffle fabric to get, refer to the diagram below while completing this step. To find the "X" measurement on the diagram, measure your waist using a tape measure (no snugness needed for this part). Take this measurement and divide it by 3.14. This number will equal "X". To get your skirt length, measure from your waist down to your ankles. 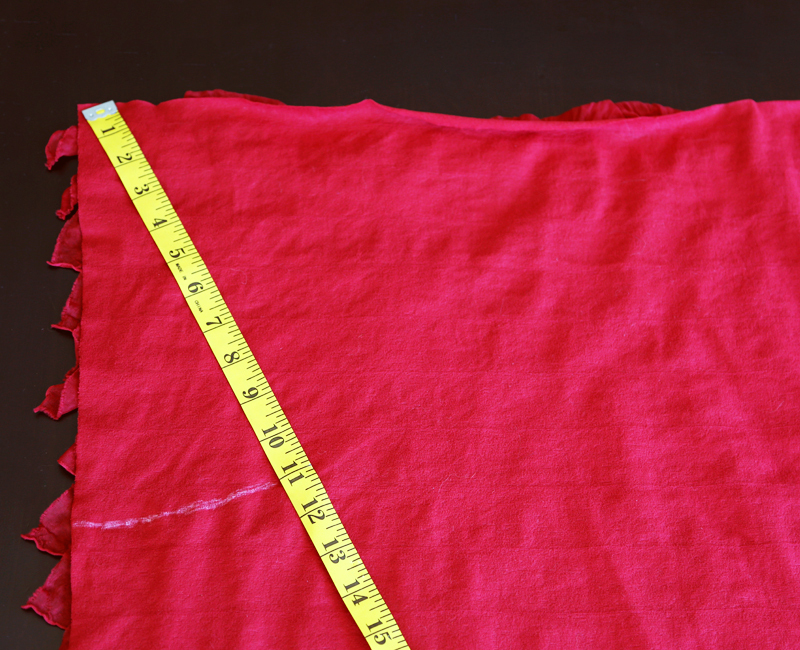 Add "X" + skirt length to get the fabric amount needed in inches for the front of the skirt only. Double this number to get the total amount of fabric needed for this project. For example: Let's say your waist measurement was 37". 37" ÷ 3.14 = 11. So, 11 ("X") + 36 (skirt length) = 47. 47 + 47 = 94 inches or roughly 2 ¾ yards. Ok, we can leave math class now and go to the cutting part. 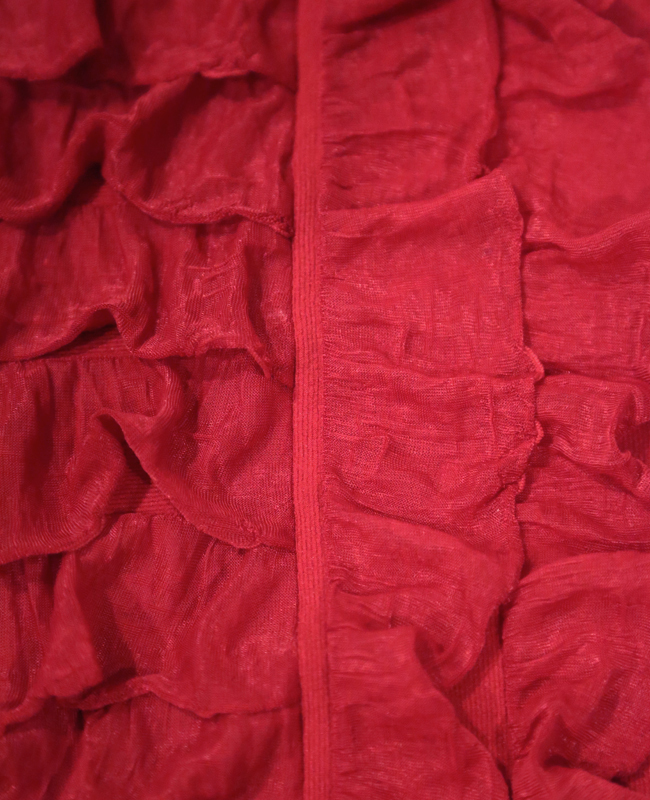 From your ruffle fabric, you will be cutting TWO identical pieces. Do not fold your fabric in half and try to cut two pieces at once. First, determine the top and bottom of the ruffles. What I mean by this is the ruffles will fall flatter one way more than the other. Now, lay the fabric right sides down on your cutting table. Make sure the fabric is laying as the diagram shows with ruffles going down. We will be doing all the marking on the BACK of the fabric before we do any cutting. You can use Tailor’s chalk, a Frixion Pen, a water soluble blue pen, or your favorite marker. To create your waist markings, use a tape measure to measure from the top left corner out using your “X” measurement. In this example, we measured out 11 inches. Do this multiple times at different angles to create your semi circle. 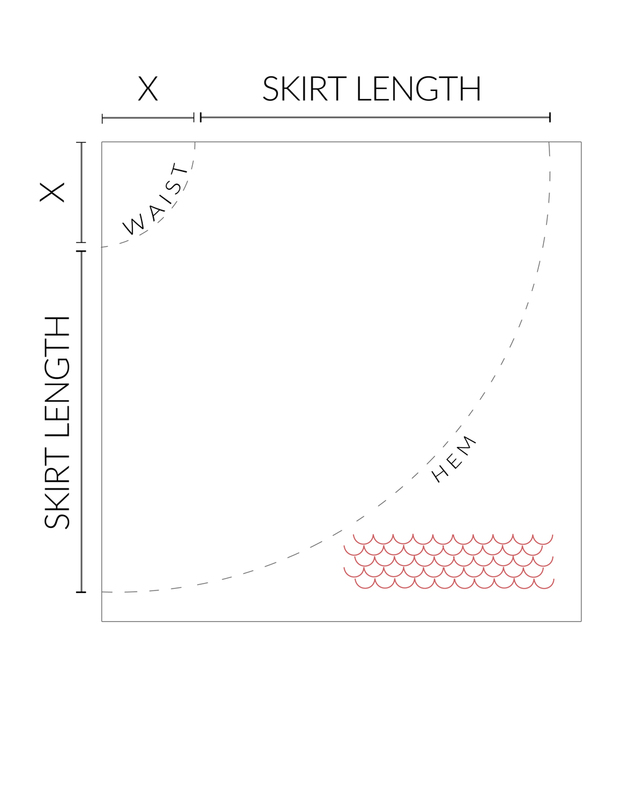 To create the skirt length marking, measure from your waist marking to the bottom of the skirt. Measure out at multiple angles to create another semi circle. We did 36 inches. Repeat these steps to make another IDENTICAL skirt piece with the same markings. Cut one skirt piece at a time using your dress shears. Cut along your waist and skirt length markings. 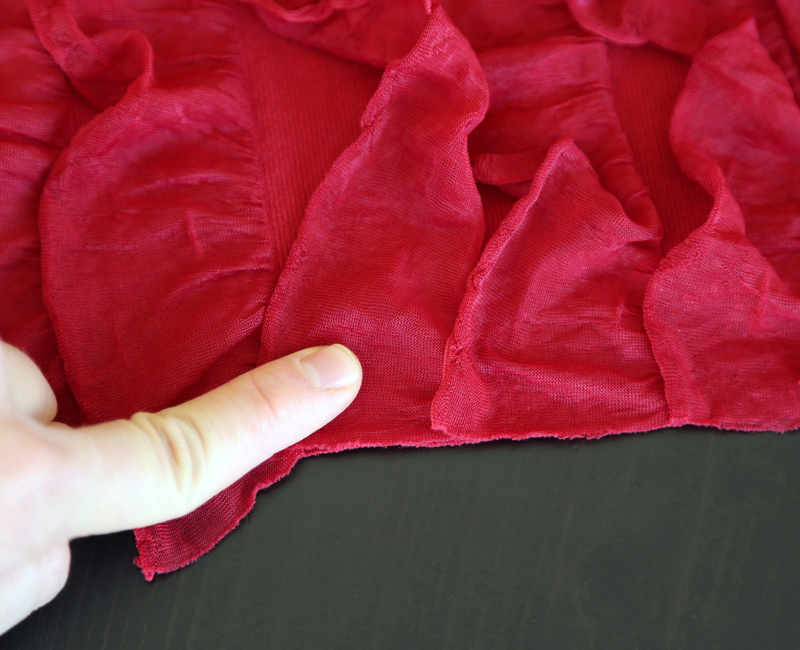 You may need to slip your hand underneath and adjust the ruffle fabric as you cut so they are smooth. 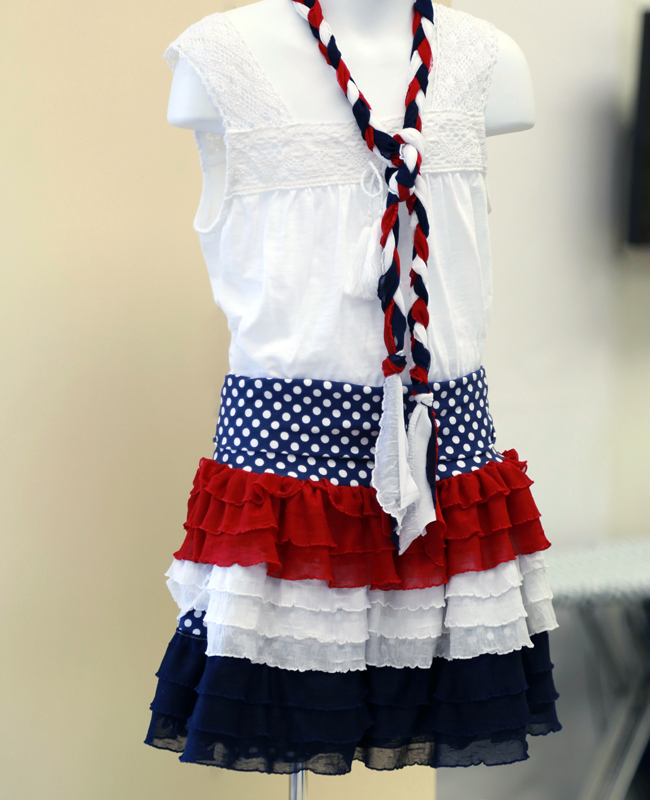 You will have long strips of ruffle parts or “flags” along the waist. DON’T CUT THIS OFF. 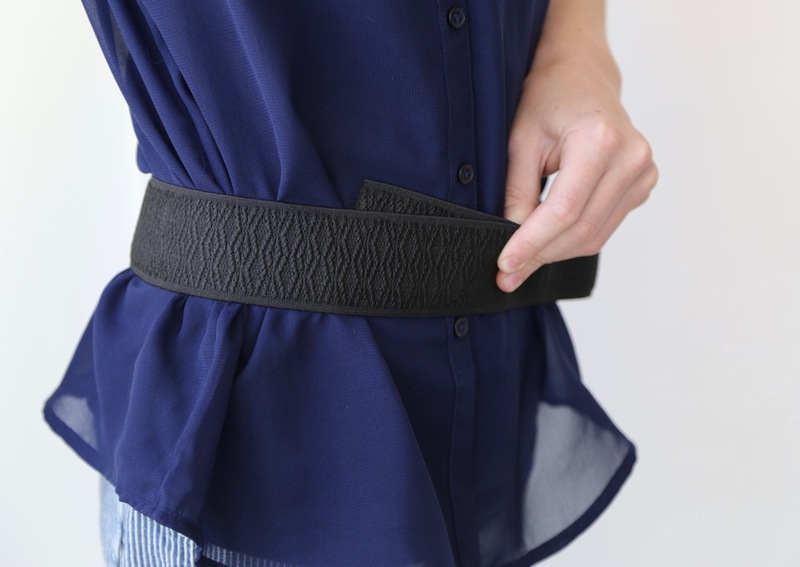 It will be incorporated into the waistband when the elastic is sewn into place. Before sewing, use the fabric glue stick to glue the ruffles down on one side and away from the other side on the seam line. If you don’t want to use glue, you can use pins. Before sewing, find the extra fabric on the horizontal edge of the fabric. 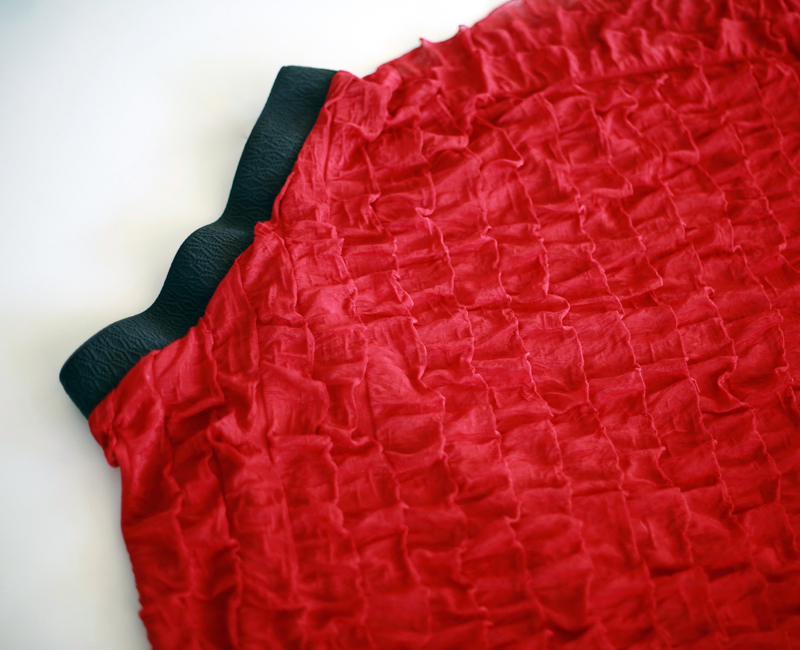 Cut away this extra underlying fabric to about ½” from the ruffle. This will avoid a long, unruffled strip on the seam of the skirt like this. Pin your two skirt pieces right sides together. Make sure the ruffles are laying in the downward direction. Stitch both side seams with 1/2” seam allowance. Backstitch at beginning and end. 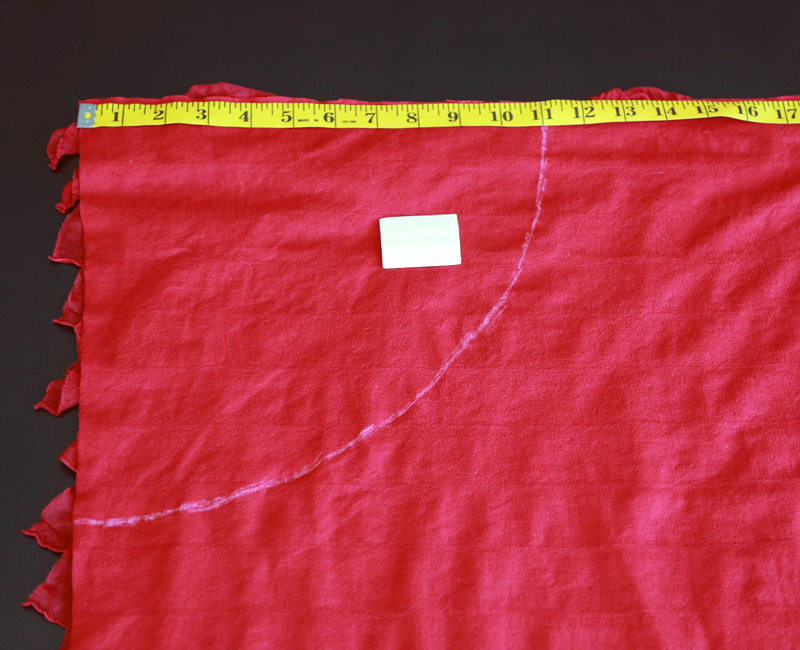 Take your elastic piece and sew the ends right sides together using ½” seam allowance. Contrasting thread was used for visual purposes. At this point, put the elastic around your waist. Does it need to be tighter? If so, keep sewing the seam tighter. Once you've got your desired tightness, open up the seam underneath and stitch it down in a rectangular shape as shown. Find the four even quadrants in the skirt waist area and the elastic piece. Use your seams as quadrant points. Mark with a pen or a pin. Pin the elastic, right sides together, to the skirt matching up the four quadrants. This is where you need to arrange those ruffled “flags” to fit in between the elastic and the fabric. Sew around the waistband using ¼” seam allowance. Trim off any ruffles along the bottom hem that look odd or funny. No hemming needed!! You may have more fabric than elastic in between each quadrant. This is ok! While sewing, just stretch the elastic till it lays flat against the fabric and continue to sew. You're finished! Enjoy your skirt. This fabric can be machine washed. Hang to dry. Need help? Call Ricci at the store at 435-628-4069. She's a pro. Make your own herringbone pillow cover to add a bit of summer flair to your home decor. Create a cute bag to organize makeup, toiletries, or colored pencils! Make one of these fun Cactus Pin Cushions in just a few hours. With a few random scraps and a good sewing thread (like Sew Complete), you'll add a functional, yet decorative piece to your sewing table.